TAG What attracted you to your chosen field and profession? DR In the past, I was attracted to mature, established businesses in need of assessing where they stood. I have worked in the gaming, utilities, insurance, publishing, and tourism industries, and in both the public and private sectors. 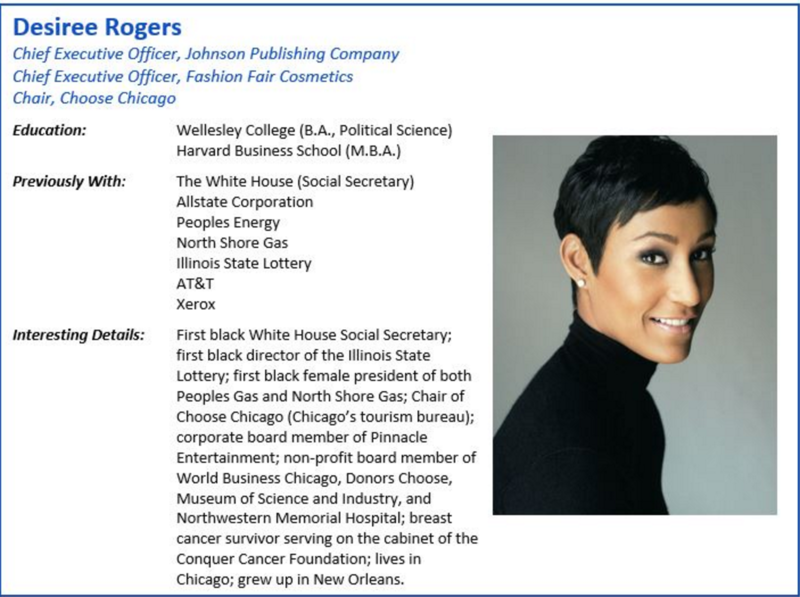 Now, I'm in the cosmetics sector after recently having sold the media assets of Johnson Publishing Company. This past summer, we sold off Ebony and Jet magazines to concentrate on our cosmetics business. I'm helping people on a personal level. When thinking of what I've accomplished in my career and my different roles, I've always wanted to positively impact people and organizations. I'm fortunate to be able to do this overseeing Fashion Fair Cosmetics. TAG What person, opportunity, or game-changing moment had the biggest impact on your career? DR Early in my career, I had the opportunity to serve in the cabinet of a sitting governor as Lottery Director. The Illinois State Lottery had been enduring a less-than-ideal downward trend. Tasked with overhauling the state's Lottery system, the position provided my first large-scale platform on which to implement sweeping change. I was able to turn the Illinois Lottery into a stable, reliable, and popular revenue producer that revolutionized the sale of instant tickets through marketing and promotional partnerships. I also oversaw the launch in Illinois of Mega Millions, the largest multi-state lotto game in the United States. I'm proud that during my tenure, instant ticket sales doubled to 600 million at the $1.6 billion dollar agency. Having a leadership role at the Illinois State Lottery enabled me to leverage and hone my skills as a manager, strategist, and leader. It was a tremendous opportunity. I was able to develop a vision, and then work to implement it on a large scale. At the same time, serving in the governor's cabinet gave me a glimpse into the inner machinations of the political arena and the pressures placed on a politician. Being exposed to this would serve me well in later endeavors. Understanding how politics impacts outcomes and whats realistically achievable has made me a more skilled leader and given me great insight into the role politics plays in being successful. TAG What is the biggest challenge you faced professionally? How did you overcome it? DR Undoubtedly the biggest challenge I have faced professionally was trying to walk in Mr. John H. Johnson's shoes, founder of Johnson Publishing Company, creator of Ebony andJet magazines, and founder of Fashion Fair Cosmetics. Over the past five years - and with great humility - I have tried to ensure that these iconic brands that were built by this remarkable and pioneering black business leader maintained their prominence and place in history. As with many mature, minority-owned businesses, being able to navigate the capital markets can be tricky. It has definitely been a challenge to maintain and grow both the publishing and cosmetics businesses with limited capital. It became clear that we would not be able to finance the growth of both companies under the same holding company. So after much deliberation, we decided to sell the media assets of the company. While a difficult decision to make, concentrating the magazines' growth under new minority leadership - separate of the cosmetics business - has allowed Fashion Fair Cosmetics to operate as a standalone business. We can fully explore the potential of the cosmetics business in ways we weren't able to before. Sometimes in business, you have to make tough decisions to create new opportunities and support a company's longevity. TAG What tools or tactics do you rely on in being a more effective leader and team member? DR There are several characteristics that I believe are crucial to anyone's ability to successfully lead. Foremost among those are grace, empathy, humility, patience, and the ability to listen. As with anything one aspires to excel at, practice is key. Every day, I challenge myself to become better at utilizing these characteristics. Additionally, effective communication is paramount in keeping things running smoothly. Implementing the right protocols and measures for effective communication can be difficult and time consuming. But once you accomplish this, you can help guide a team so they're on the same page, and able to work more cohesively and seamlessly. TAG Share a story about an interesting or difficult negotiation and how you were able to gain more influence and leverage as a result. DR Recently, the CEO for Choose Chicago resigned. Choose Chicago is the city's tourism bureau, and I serve as Chairperson. The timing was difficult since the city was set to host the NFL Draft and the James Beard Foundation Awards within a few months. It was a tense time and we needed a new CEO as soon as possible. As Chair of a government entity, it was my responsibility to guide the organization through the selection process. In order to promote a more sustainable outcome, I made the decision to ensure that we had a very inclusive process - combining all the interests of a very diverse board. The selection committee was comprised of over 20 participants who wanted to voice their opinions. It was a lot of views to navigate and meant that coming to a decision could take more time, but I knew different stakeholders needed to be heard and included. As tedious and complicated as the process was in the long run, we were able to get buy-in from all of our partners in the end. I'm pleased that the new CEO is well on his way to success. TAG What do you see as your unique value proposition and how has your personal background prepared you to excel? DR Some people graciously admit defeat, but I refuse to accept it. Opportunistically, I feel there will always be a positive resolution, and will work towards a denouement regardless of perceived obstacles. And while I doubt my personal background differs too greatly from that of many other black middle-class women, it has nevertheless instilled in me a want and a need to unite as one and push forward those issues that are of importance to black Americans. TAG What is your proudest achievement? DR I admire and am extremely proud of who my daughter Victoria has become. I think my greatest achievement is that of a parent. Her father and I have been blessed that she's been able to take the best of both of us and become the woman she is today.